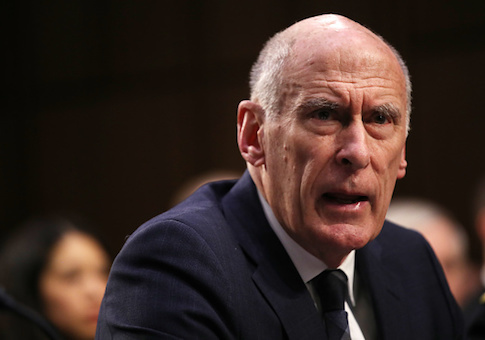 DNI: Beijing Set for ‘Ideological Battle’ with U.S.
"While we were sleeping in the last decade and a half, China had a remarkable rise in capabilities that are stunning," Director of National Intelligence Dan Coats told the Senate Select Committee on Intelligence. Coats, appearing with leaders from the CIA, FBI, National Security Agency, and Defense Intelligence Agency said China's theft of U.S. technology is not limited to competing but to "gain superiority." Globally, China under President Xi Jinping is spreading its system in the developing world through an economic program called the Belt and Road Initiative. "It's a serious issue that has to be dealt with," Coats said, adding that "rule of law, international norms, and fairness in trade and international engagements is not the Chinese model." Coats in his prepared statement warned that China is preparing for a "coming ideological battle" with the United States. "Chinese leaders will increasingly seek to assert China's model of authoritarian capitalism as an alternative—and implicitly superior—development path abroad, exacerbating great-power competition that could threaten international support for democracy, human rights, and the rule of law," he stated. Xi and his advisers are imposing new dictatorial measures at home while backing authoritarian regimes around the world. The practice can be "corrosive to civil society and the rule of law," the DNI said. Xi also declared last year China will try to launch a program to reform the global governance system that Coats forecast will produce increased Chinese activism internationally and promote "a Chinese worldview that links China's domestic vision to its international vision." "Beijing has stepped up efforts to reshape the international discourse around human rights, especially within the U.N. system," he stated. The Chinese are seeking to block international criticism of the communist system, and also to erode norms, such as the idea that the international community has a legitimate role in scrutinizing human rights abuses. China also is seeking to narrow the definition of human rights based on economic standards as part of the effort. The harsh assessment of the growing threat from China contrasts with previous annual threat briefings. For example, in February 2011 then-DNI James Clapper told a similar hearing that despite China's growing military capabilities that pose potential threats, "what we always have trouble gauging is intent versus the capability." "Having said all that, my greatest concern, though, does not lie with a nation-state posing a threat to us as much as it is in the area of terrorism," said Clapper who through public statements revealed himself to be a liberal political partisan after leaving office after the administration of President Barack Obama. Coats said that countering Chinese activities will require exposing the practices, noting the two federal grand jury indictments on Monday against the Chinese global telecommunications company Huawei Technologies. Huawei, an ostensibly private company closely tied to the government, was hit with federal charges of stealing American telecommunications robotics technology from T-Mobile, and for violating U.S. sanctions law by covertly helping Iran to use the U.S. financial system to move more than $100 million. Coats said U.S. intelligence officials have been alerting American businesses to the Chinese dangers. FBI Director Christopher Wray warned that Chinese intelligence activities are the most significant spying threat. "The Chinese counterintelligence threat is more deep, more diverse, more vexing, more challenging, more comprehensive, and more concerning than any counterintelligence threat I can think of," Wray testified. In the past two years, the U.S. government has prosecuted three former U.S. intelligence officials on Chinese-related espionage charges, and indicted more than nine Chinese officials for computer hacking operations against U.S. companies. Wray said the American people are beginning to wake up to Beijing's control over supposedly private Chinese businesses. "The lines between the Chinese government and Chinese Communist Party are blurred if not totally erased," Wray said. "The lines between the Chinese government and state-owned enterprises, the same." Wray also said lines between the Chinese government and ostensibly private companies also are being erased—"and especially the line between lawful behavior and fair competition and lying and hacking and cheating and stealing." Defense Intelligence Agency Director Lt. Gen. Robert Ashley said Chinese products, such as semiconductors or microchips, pose a threat to the military supply chain used to build weapons systems. DIA is working to make sure weapons are not built with Chinese products purchased by U.S. suppliers that could pose a security risk of sabotage or remote hacking. Ashley noted that in the past four years 13 U.S. academic institutions have shut down Chinese government-funded Confucius Institutes that have been used for both intelligence-gathering and influence operations targeting universities. But the institutes remain "a global problem." "While we've closed down about 13 [institutes] in the U.S., there's been about a 23 percent increase globally, in Asia and Europe and other places and there's probably about 320-plus institutes that exist globally." On Huawei, Ashley said the company is not as independent as other international companies, and cannot decide for itself whether to become a private firm or state-controlled company. "That decision does not lie with Huawei," he said. "It lies with the [Chinese Communist Party]; it lies with Xi Jinping in the way that they are starting to centralize greater the management of those businesses." The DIA director described the Chinese system as "authoritarian capitalism" with the government and Party controlling Chinese companies and requiring they provide business and other information to Beijing. U.S. adversaries are planning to use new and different methods to target the 2020 elections to shape policy outcomes favorable to the adversaries in the United States. The danger from weapons of mass destruction will grow in 2019, especially the use of chemical arms. Islamic terrorists, including al Qaeda and the Islamic State, remain a threat and will continue to target the American homeland. China, Russia, Iran, and North Korea are increasingly using cyber attacks to "threaten both minds and machines" to steal information and target infrastructure. North Korea remains a threat and is unlikely to give up its nuclear arms, despite talks on denuclearization. Iran will threaten U.S. interests in 2019 based on Tehran's regional ambitions and improved military capabilities. Afghanistan's war will remain at a stalemate in the coming year. China and Russia are training and equipping military space forces and fielding new antisatellite (ASAT) weapons to target American satellites while pushing for global agreements banning space weapons. Chinese cyber attacks are a major threat and could be used for temporary disruption of critical infrastructure, such as disrupting a natural gas pipeline for days to weeks. Russia remains a capable U.S. adversary and is developing new strategic and conventional weapons. Iran currently has not renewed development of nuclear weapons but Iranian officials have publicly threatened to reverse some of the constraints of the Joint Comprehensive Plan of Action limiting its nuclear programs. Iran continues to develop long-range missiles. China will continue building up its military maritime presence in the South China and will continue to pressure Taiwan into accepting Beijing's claims on the island. Sen. Jim Risch (R., Idaho) said U.S. media reports have over-emphasized the threat from Russia, which is a concern. "In my judgment and in the judgment of many others, the real concern is China," said Risch, the new chairman of the Senate Foreign Relations Committee. In his prepared statement, Coats provided additional details of the growing threat from China in Asia and beyond as the Chinese Communist Party is "deepening its authoritarian turn" under Xi. Xi's hardline policies are increasing the risks of a decline in U.S.-China relations. "The resulting hardening of Chinese politics and governance probably will make it more difficult for the [Chinese] leadership to recognize and correct policy errors, including in relations with the United States and our allies and partners," Coats said. Xi removed one of the few checks on his power in March 2018 by eliminating presidential term limits. The Party also increased control over the economy and society by tightening legal and media controls, marginalizing independent voices, and intensifying repression of Muslims, Christians and other religious minorities. Perhaps "millions" of ethnic Uighurs are being held in detention camps as part of the repression. China also is increasing the use of technology for repression through facial recognition, biometrics, and vehicle GPS tracking to "bolster its apparatus of domestic monitoring and control," Coats stated. New restrictions have been placed on Chinese scholars and researchers limiting their communications with U.S. counterparts. One significant disclosure by Coats is China's global ambitions. By contrast, U.S. intelligence analysts for many years in the past insisted China had no hegemonic objectives beyond Asia. "We assess that China's leaders will try to extend the country's global economic, political, and military reach while using China's military capabilities and overseas infrastructure and energy investments under the Belt and Road Initiative to diminish U.S. influence," Coats said. Beijing is expected to face "political pushback" from foreign governments, however. Militarily, China is planning additional military bases and access agreements beyond its lone overseas military base on the Horn of Africa at Djibouti. The Chinese are exploring bases, support facilities, or access agreements in Africa, Europe, Oceania, Southeast Asia, and South Asia. China also is using its commercial development and military ties to expand its military reach globally. "Successful implementation of the Belt and Road Initiative could facilitate PLA access to dozens of additional ports and airports and significantly expand China's penetration of the economies and political systems of participating countries," Coats stated. This entry was posted in National Security and tagged China, Dan Coats. Bookmark the permalink.